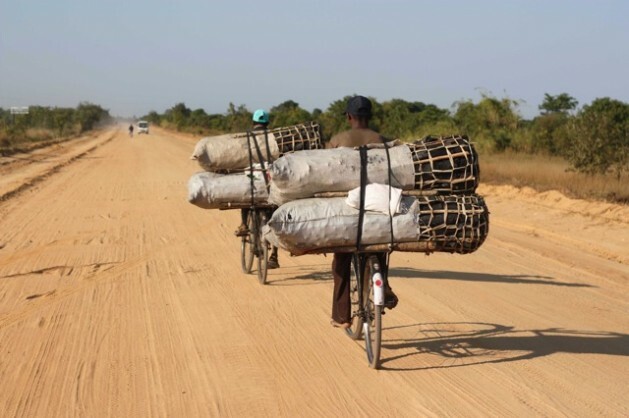 MAPTUO, May 26 2012 (IPS) - Along a dirt road in Mozambique’s Sofala province, a long line of men on bicycles stretches into the distance, each carrying an impossibly big bag of charcoal strapped to his bike. The journey to town takes two days from where they or their families cut down trees and put logs in earth-covered pits to smoulder, to produce the charcoal. It is a common sight in a country where 80 percent of people rely on charcoal for cooking. Each year the charcoal sellers’ journey gets longer as locals and foreign logging companies chop down indigenous forests, the source of coal in this southern African nation. However, breaking the country’s dependence on “dirty” fuel is the aim of a for-profit venture called Cleanstar that began selling ethanol cooking stoves in the capital, Maputo, earlier this year. The ethanol is made from cassava, or mandioca, which is grown in virtually every back yard here. “Interesting. The alcohol they use comes from mandioca, a product that is produced a lot here. That is good,” says one curious potential customer, Maputo taxi driver Milton Bilale. With the price of charcoal in Maputo’s many open-air markets rising sharply, Cleanstar is banking on being able to corner a tidy slice of the domestic fuel market by offering a clean alternative at no greater cost. The project’s backers, including Danish biotech giant Novozymes (whose enzymes turn the cassava into ethanol), believe that if it takes off here, it can be replicated in any number of eastern and southern African countries where charcoal prices are spiking and a growing population of urban poor are prepared to spend their disposable income on “aspirational” consumer products. “We want to demonstrate that you can use this technology, you can work with the bottom of the pyramid and you can make money,” explains Novozymes president Steen Riisgaard. So far, the response has been fairly enthusiastic. “We like it very much. You don’t dirty the pan because you don’t dirty your hands. It is fast. You get the food quickly,” explains Rosa Lina Manhiça, a grandmother who lives in the Maputo neighbourhood of Mavalane, where the product is being piloted. Designed by the Swedish firm Dometic, the stove was first used on a large scale in Ethiopian refugee camps. Its stable base makes it difficult for children to knock over. The fuel inside will not spill out, nor does the stove produce black, asthma-causing smoke the way charcoal burners do. So it is safe to cook with inside the house. White and easy to clean, it is a step closer to an electric hob. “Many women work in the city and see people using electric stoves,” says Cleanstar’s sales director, Thelma Venishand, who claims the stoves have become something of a status symbol. “You would usually find this in the living room, not the kitchen,” she explains. “People like these stoves. We don’t get headaches anymore from smoke. But the problem is the price,” says another Mavalane homemaker, Maria Douça. Already heavily subsided, the cost of 30 dollars is nevertheless the equivalent of a week’s wages in this lower-income neighbourhood. Dometic will have to be able to track the stoves’ use over time so that auditors can verify the amount of carbon replaced – a prerequisite to generating carbon credits. These carbon credits will be sold on international carbon trading markets to polluting industries that want to offset their greenhouse gas emissions. The Bank of America Merrill Lynch invested four million dollars in the project with the expectation of being able to trade the carbon credits it generates, once the project gets United Nations approval. “Based on the fact that we are displacing charcoal, based on the fact that we know there is a huge amount of carbon benefit even with one cooking stove, our expectation is that this is going to deliver the kinds of volumes that are very interesting for us,” says the bank’s global head of carbon markets, Abyd Karmali. Until recently carbon market investors preferred large-scale initiatives in China and India that generated high returns with low risk. What has changed is that from next year the European Union has decided to restrict new carbon credits accepted by its Emissions Trading Programme – the world’s biggest carbon trading market. Only new credits from least developed countries will be eligible. Suddenly, investors are sitting up and taking notice of projects like Cleanstar. Mozambique is one of the world’s 10-fastest growing economies and recent big discoveries in coal and gas have made it increasingly attractive as an investment destination. “There is no reason why it can’t be a destination for carbon as well,” adds Karmali. Vast coal reserves to the east of the country are driving the frenetic pace of economic growth. Foreign mining companies have begun exporting coal to India and China where it will be used to make steel, fuelling rapid industrial development and contributing to further global warming. In an ironic twist, Cleanstar has built what it claims is the world’s first sustainable cooking fuel plant close to the Port of Beira, Sofala province, and just a few hundred metres away from the railway line carrying coal to the coast for export. When the plant came on line in late May it used cassava imported from neighbouring South Africa as a temporary solution. Eventually the plan is to source the fuel from farmers in the nearby village of Savane. As in much of rural Mozambique, malnutrition is rife in Savane. Farmers eke out an existence based on subsistence cropping, with little or no access to fertilisers and no means of storing their harvest in order to be able to eat all year round. Cleanstar wants farmers in the area to sign up to a sustainable farming model which will involve rotating cassava, sorghum and vegetable crops but also planting indigenous trees to reforest an area denuded of the coastal forest that covered it just 20 years ago. “When you fly over this region now you see this patchwork of degraded farms. In ten years time I imagine strips of rich forest in between a vibrant, productive agricultural zone,” says Cleanstar’s managing partner, Sagun Saxena. Villagers are curious about the project, but they have also seen several donor-driven agricultural initiatives start up and fail. Mother of seven Ana Antonio is one of several thousand Savane residents who have agreed to take part. With the first of her new cassava crop poking out of the earth in her front yard, she is waiting to see how this initiative might benefit her family. In the meantime, she says, she will go on supplementing her income the old way by cutting down trees and burning the logs in earth-covered pits.